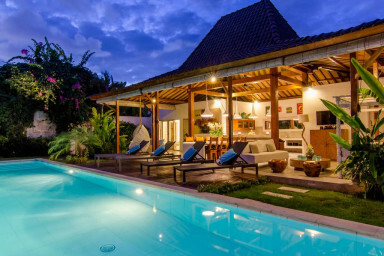 Popular Villa Sukacita and Villa Niri now can be rented together! Both villas are 4-bedroom each connected with a door, come with the same Joglo style, full-time maids and security at night. All 8 bedrooms have air-conditioned and en-suite bathroom with hot water. TVs in living area with international channel. WiFi covers the entire area (bedrooms, living area and swimming pool). Perfect for big group of 16 people. Extra beds can be added to accommodate more people with maximum occupancy is 18 people. Located in Seminyak, 300 meter to Eat Street and 500 meters from Seminyak Beach. These villas are often rented separately and have limited availability, please do not hesitate, go ahead and book when it is available.